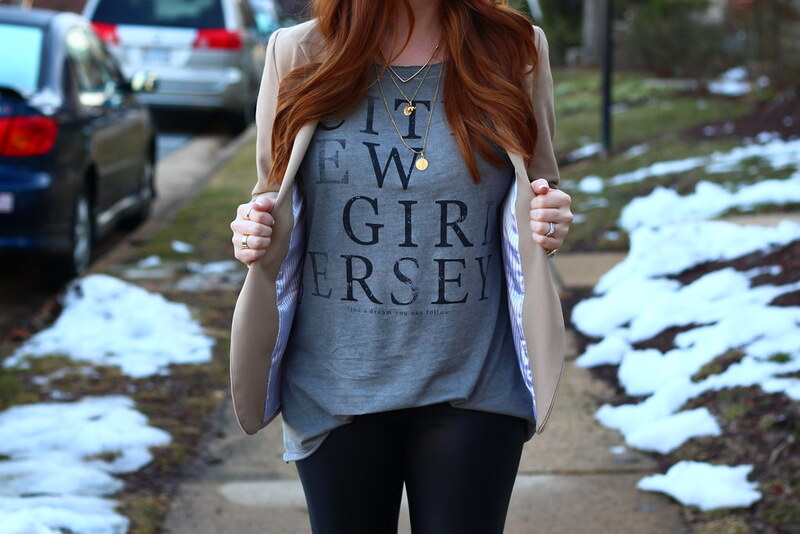 So this tee may be on the verge of false advertising because I'm not actually from New Jersey (though I was born there). But growing up about five minutes from the border, I spent a lot of time in the Garden State -- especially down the shore during the summers -- so I consider it "home" just as much as I do Pennsylvania. Plus, my dad was born and raised in Jersey City, and this shirt kinda reminded me of him so it has a special place in my heart and wardrobe. I'm also never one to say no to a cozy tee, and this one is slouchy, soft perfection! I love the high boot with the tshirt! You look gorgeous! I love all of your outfits, but I think you should take more photos without your sunglasses! Hands down one of your best features are your eyes. We don't see them enough.